Couscous is a coarsely ground type of semolina pasta that resembles rice. It is made from semolina, water, salt and wheat flour. 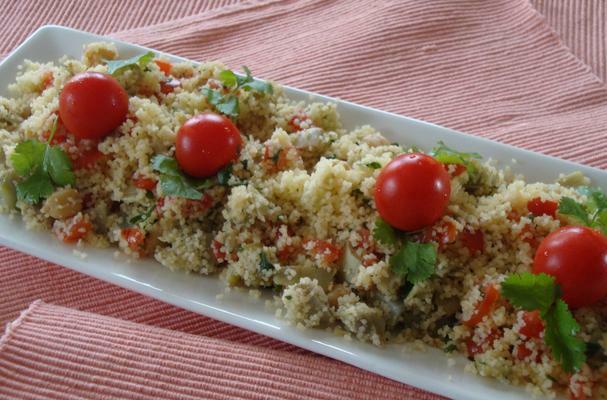 Couscous is a staple in many North African countries and is often steamed and served with meat and vegetables. There are several types of couscous the most common being Israeli couscous which would be similar to orzo pasta. Couscous is most often made from semolina wheat, but is also made with either millet or barley. A grain dish of spherical granules made by rolling and shaping moistened semolina wheat and then coating them with finely ground wheat flour. Flavors: bland, it will absorb whatever flavours you mix in with it. Choosing: Couscous is already prepackaged. Check the packaging for holes or any signs of damage. Buying: Most packaged couscous is from the instant variety, but there is the traditional variety so make sure you know what you want to make sure you have enough time to make them. Procuring: Couscous is a grain made from semolina (coarsely ground durum wheat) or, in some regions, from coarsely ground barley or pearl millet. In Brazil, the traditional couscous is made from pre-cooked sweet-corn flakes. Couscous is traditionally served under a meat or vegetable stew. It can also be eaten alone, flavored or plain, warm or cold (e.g., mixed with tabouli), or as a side dish. Add 1/2 cup boiling water to 1/2 cup couscous. Cover for 5 minutes. Cleaning: Rinse gently before cooking. Store couscous in a sealed container, in a dry, cool place. Couscous is a healthy grain product and is eaten worldwide for it's nutritional value. History: One of the earliest references to couscous in Northern Europe is in Brittany, in a letter dated 12 January 1699. But it made an earlier appearance in Provence, where the traveler Jean Jacques Bouchard wrote of eating it in Toulon in 1630.
are a professional on this subject. Well along with your permission let me to take hold of your feed to keep updated with forthcoming post.